The 8016 can be programmed to batch from 1-10 seperate batches of differing amounts. Using the key panel the actual time can be set together with amounts to be batched and at what time. 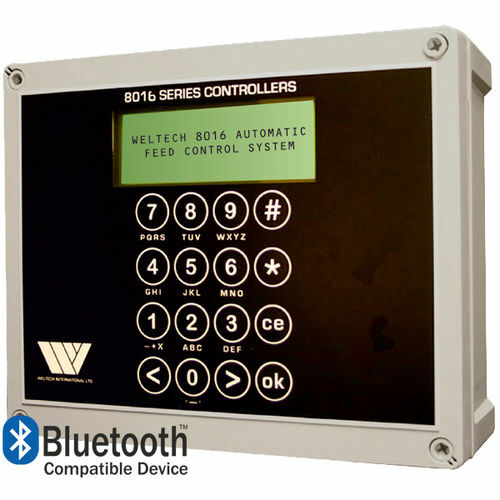 The 8016 can control the auger and operate electronic values which are mounted onto the feed auger above holding hopper. The 8016 will automatically operate each value and dispence the correct amount of feed into each. The 8016 will show the amount of feed in the Silo, last delivery, total deliveries, last amount batch and total batched into each hopper. Data can be downloaded to a USB stick, computer or printer.